The Archeological Survey of India (ASI) has started repair work on the protected site of the historic Qutab Minar in Delhi as bat excreta and bird droppings have caused severe damages to the centuries-old monument. 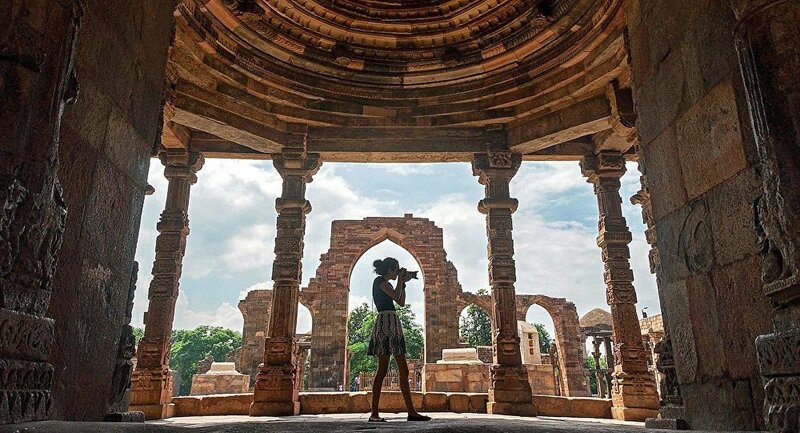 New Delhi (Sputnik) – After more than half a century, the iconic pre-Mughal era tower, Qutub Minar, is being renovated by the Indian government to mend damages and restore its beauty. The ASI will be replacing the wooden doors and windows that have been damaged by bird droppings and the whole exercise will take at least a month, an ASI official told the PTI. Qutub Minar is getting refurbished after 50 years. The 72.5 meter high Qutab Minar is part of the UNESCO World Heritage Qutab Complex on the southern periphery of Delhi. Qutab Minar is known worldwide for its iconic stone-made tower, endowed with rich inscriptions. The tower has four round ornate balconies at different levels, with an opening at each level. The tower has a diameter of 14.32 meters at the base and 2.75 meters at the top. The Delhi Sultanate's founder, Qutab-ud-din-Aibak, started the construction of Qutab Minar's first storey around 1192. In the year 1220, Aibak's successor and son-in-law, Iltutmish, completed the rest of the floors. Later during the Tughlaq rule, Firoz Shah Tughlaq replaced a floor damaged by lightning and also added one more level to it.